Do you remember the first time you voted? Who did you vote for? How did it feel? Did someone or something influence you to participate in the civic process the first time? With the November 2018 midterm elections coming up in a few months, some high schoolers in the Midlands are already starting to anticipate the answers to these questions and preparing for their first time voting. 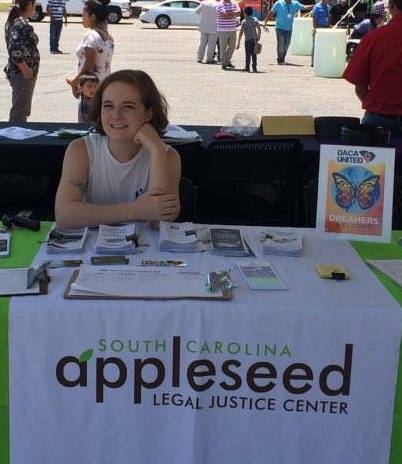 SC Appleseed staff had the chance to sit down and talk to Sarah, a graduating Senior at Dreher High School in Columbia SC, recently, about why voting is important, and why, as a young person, she believes it’s so vital to both vote and to be involved in her community. Sarah grew up here in Columbia and remembers being in the 3rd grade in 2008. The teacher did a poll of the room regarding preference for presidential candidate – that year, John McCain or Barack Obama. That’s one of her first memories of starting to form opinions about candidates and political issues – as an 8-year-old! Second, Sarah talks about the importance of her teachers at Dreher High School. “I’m with them more than I’m with my family at this point, so I feel very influenced by them,” she explains. “My Environmental Science teacher starts class with a few headlines and articles, to make sure we keep up with current events,” and she explains that the “nuclear debacle” with SCE&G, the recent SC Legislature vote on the solar cap, gun reform, and race relations are all especially important issues to her when considering her candidate choices. Other teachers have also informed her perspective. Sarah’s Government and Economics teacher reminds her class that voter turnout among her peers is “super low,” which has motivated her to be involved. “Voter turnout is so low among 18-24 year olds,” Sarah explains, “and our voices need to be heard. Politicians need to listen to us and my generation.” In the US Government classes at Dreher, teachers offer resources to students to get registered to vote. Are you a first time voter in South Carolina? Make sure you register in time! You must register at least 30 days prior to election. Find out more at www.scvotes.org!